We are a membership pool offering first class tennis and swimming facilities to our members. 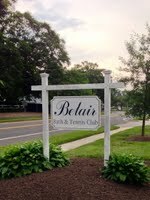 Established in 1963, on the historic grounds of the Belair Mansion, Belair Bath and Tennis has grown into one of the premier swim and tennis clubs in Bowie. Memberships include free swim and tennis lessons and a variety of great social events throughout the summer. Full time members of Belair Bath and Tennis are not just part of a great pool and tennis club, but they are also owners of a piece of Maryland history. Our club owns an 8 acre parcel of land between the historic Belair Mansion and the Belair Stables. The property includes the Mansion Gardens and several original mansion structures. For more information on Belair Bath and Tennis look through our website or contact us at the link above.